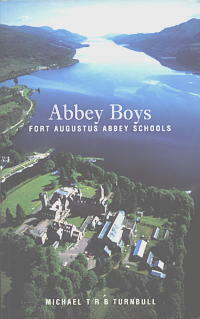 ABBEY BOYS covers the history of St Benedict’s Abbey, Fort Augustus from its foundation in 1878 to the closure of the School in 1993. As well as recounting the story of the School and its enormous contribution to the life of Scotland through Old Boys such as Lord Lovat, Sir James Calder, Lord Carmont, Archbishop Joseph McDonald and Bishop Bennett of Aberdeen, the book also deals with key events and personalities in the life of the monastic Community, including biographies of monks such as Abbot David Hunter Blair, archaeologist Dom Odo Blundell, the linguist Fr Cyril Dieckhoff and the proponent of experimental monasticism, Fr Denys Rutledge as well as biographies of many of the laybrothers and lay Old Boys (and Old Girls) and their achievements in business, the arts and in sport.. The history of the two Priories – St Andrew’s Priory, Edinburgh and Carlekemp Priory, North Berwick is also included, as well as that of the highly successful Summer Schools. An Appendix lists the names of those awarded Colours for Rugby, Hockey and Cricket.